Get a greenhouse with superior design and functionality with Cape Cod greenhouse. 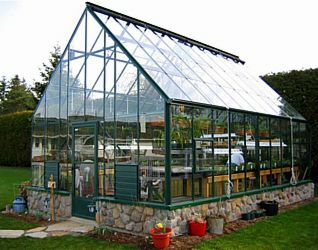 These greenhouses have a tall 45 degree slope roof which offers several advantages including: more headroom, more attractive Victorian look, larger roof area reduces fluctuations in temperature, steep slope and added roof surface area increase solar gain in the winter and reduce heat gain in the summer. This makes them a favorite among orchid and tropical plant growers. Cape Cod greenhouses can be covered with 6mm twinwall polycarbonate, tempered glass, or glass side and end walls with polycarbonate on the roof. All models feature an aluminum capping system which ensures the covering will stay on the greenhouse in high winds. Each greenhouse includes a sturdy pre-hung storm door with adjustable tempered glass window and screen. The standard height of the side walls is 5' 6", giving ample room inside for tall gardeners and hanging baskets. All Cape Cod greenhouse lengths are extendable in 2' increments to allow for future expansion. The included instructions and step-by-step assembly video make these greenhouses easy to assemble.